Mistakes are always going to happen. Things might go out of control, and you might need to deal with an online crisis. Before any crisis, you need to think about what you need to know before it happens. You need to get ready to plan, you need to get ready to deal with fire and angry mobs. So, naturally, the place we turn to for inspiration is, of course, the rich and vibrant characters in Game Of Thrones. 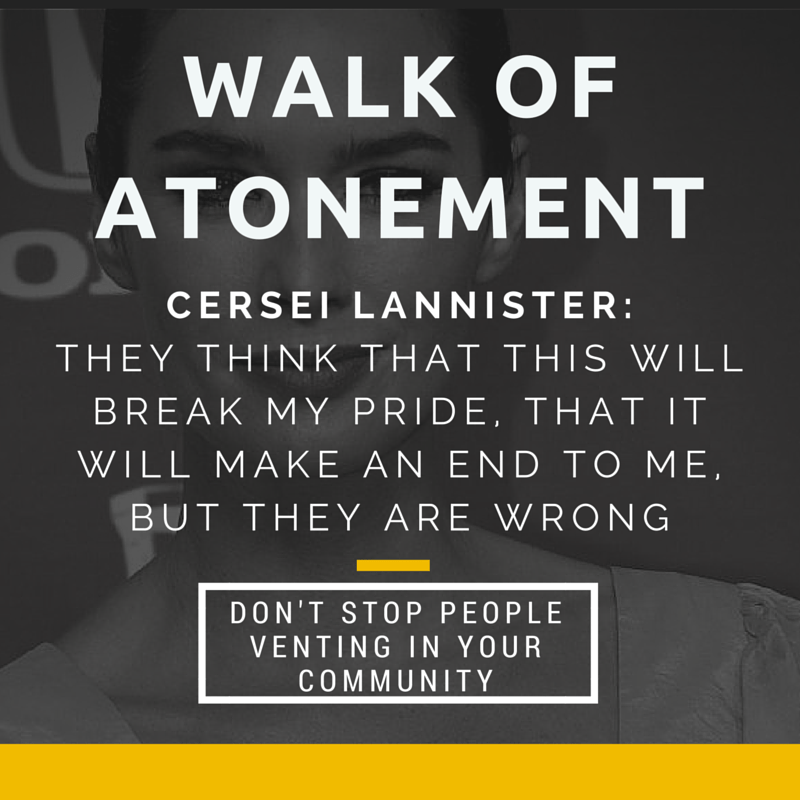 This is How To Handle a Social Media Crisis According To Game Of Thrones. Tywin Lannister: You seem rather drunk. Tyrion is a master of planning, plotting and schemes. 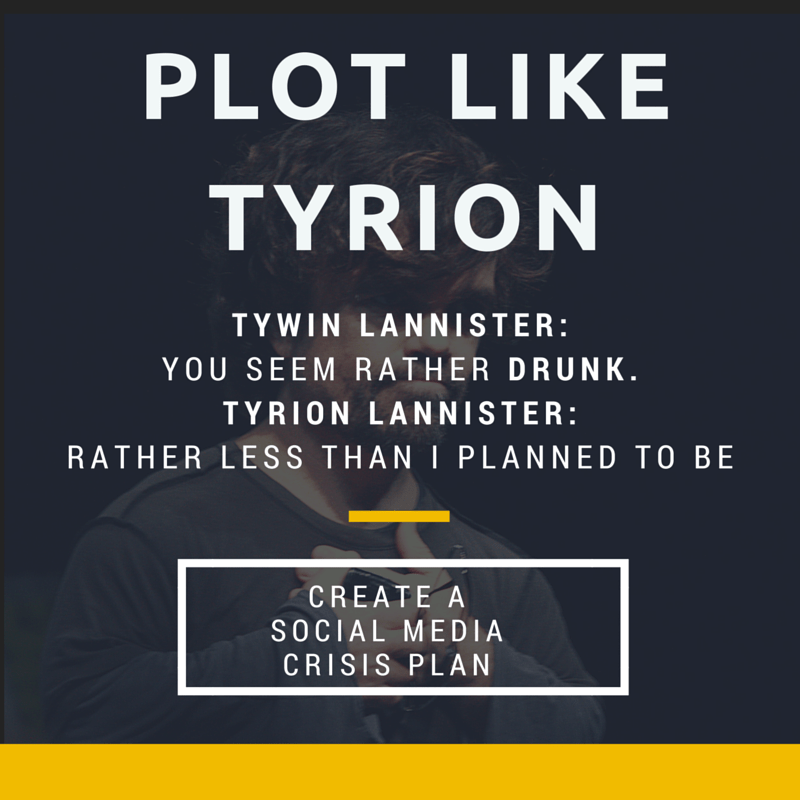 What can we learn from Tyrion before a social media crisis? The first thing is that we can come up with a Social Media Crisis Plan. This is, of course, thinking before any crisis happens about all the possible issues that might come up in your business. What are the ways someone could get hurt using my product? Physically or emotionally? What happens if there is bullying or harassment in my community? What illegal things might happen in my community that I need to be prepared for? Before any of these things happen, determine an action plan. Who needs to be looped in (this could be everyone from your manager to receptionists, your lawyers or the police). This is especially important because when a crisis hits – your blood starts pumping and you aren’t always thinking straight. Having a guide made in the cool makes dealing with issues a lot easier. Jojen Reed: You didn’t dream it, you saw it. So did I.
Bran Stark: You have the sight, too? Bran has the sight of the three-eyed crow. He sees everything, past, present and future. What can we learn from the littlest Stark? You need to be watchful in your community. Get to know your community members, and know what the signs of trouble are. Know which members like to stir things up, which ones are irritable and which ones are sensitive souls. Pay attention especially if you see threats, or if someone is being bullied. Pay attention if you see a pattern in problem or complaints – it might be an early warning sign that a social media crisis is underway. Eddard Stark: I was trained to kill my enemies, Your Grace. Cersei Lannister: As was I.
Ned Stark is a lesson for all of us in recognising our enemies. This is about knowing what a troll looks like and knowing when to back off and not engage. Trolls aren’t after answers or discussions – they are after humiliating a target, causing pain through techniques like accusations or putting false words in your mouth. The best thing you can do with a troll is to back off and, if possible throw them out the Skydoor (aka ban them). 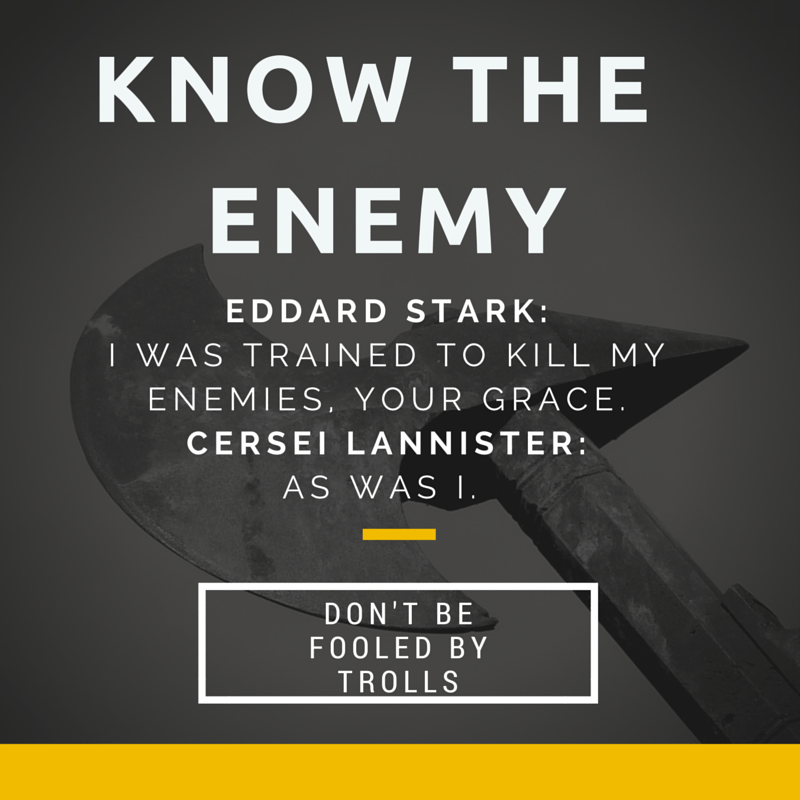 Be aware that trolls, like White Walkers, can respawn in another form (of user account) so recognise the behaviour patterns in your trolls! When you see the first signs of trouble, you are the first defence. You need to engage with the person and do your best to resolve the situation. Be respectful – there is a person at the other end, and they wouldn’t post something unless they were passionate about the issue. Do your best to respond quickly, factually and politely. Depending on the situation and the comment, you might want to make light of it, to lift the mood – but be careful not to make fun of them. Tywin Lannister: The king is tired. See him to his chambers. Joffrey Baratheon: I’m not tired. Joffrey Baratheon: I’m not… TIRED! When the Lannisters have something private to discuss, it’s never in court in front of the Iron Throne – it’s in private in their chamber. Remember that the key to dealing with someone who is upset is going your best to take the conversation out of a public place. Ask them to inbox you or privately email you so you can discuss the issue offline. Do this within one hour of the issue being posted. Danerys is dragon-blooded, and she is determined to reach her goals. She wants to break the power in Westeros for herself. But what we’re drawing on here – is her passion to break the system. And this is, of course, your post scheduling system. When a crisis hits – you need to stop the system of scheduled posts. You need to know exactly what is going out and when – there is nothing worse than a crisis hitting, and you’ve got an auto-scheduled post going out which inflames the issue further! The only thing you want to post is an official statement about the issue, and refer people back to that statement, so they understand that their views are being heard. If something has gone wrong, and a social media crisis escalates, there might be hundreds of complaints and bad press. This might happen every day for a week even if you’ve responded quickly, resolved the issue AND posted individually on the posts of those complaining; there will always be a flood of new comments. This can quite genuinely last a whole week. But be mindful that the time will pass. Let people be angry on your page. In fact – that’s exactly where you want people to be angry. You don’t want to block or delete posts, because if people are posting on your official channel – it gives them a place to vent. On top of that, it’s a place you own and can see all the complaints. The worst thing you can do is shut down your channel, so they vent all over the REST of the internet. Arya is not afraid of battle, but she knows when to fight when to hide and when to watch and learn. When things get tough, you need to refer to your Social Media Crisis Plan and know when to escalate issues – because sometimes it’s not the time for you to fight. It might be a call for your boss or your CEO. Keep everyone who needs to be in the loop across what’s happening – because it can make things even hairier if someone is asked to resolve or comment on a messy situation they know nothing about (and they make the wrong call). If there’s an issue, escalate it to the level above you within the hour if needed – and by the end of the day you might need to push it all they way up the chain when you create an end-of-day status report. 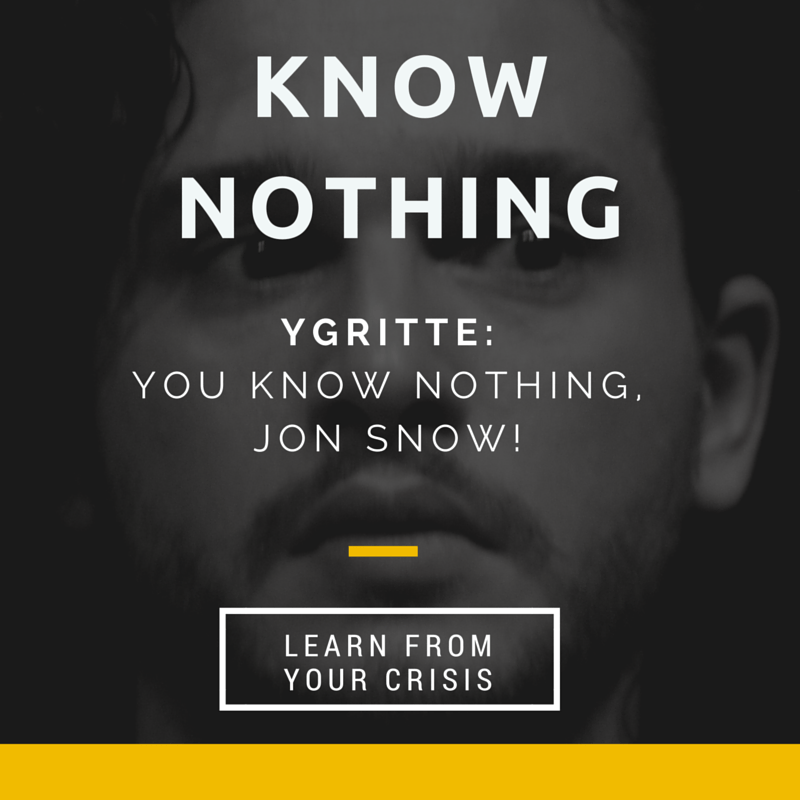 Ygritte insists that Jon Snow knows nothing – and the feeling of blindness is something that affects everyone in the middle of a crisis. Having a plan help alleviate those fears and accepting that it will, in the end be over. The reality is that you will learn a lesson from your crisis – it might be about how to set up processes in the future, or about changing your products. In the end, you need to review what you’ve learned from your crisis and update your Social Media Crisis Plan, so you’re better prepared next time. 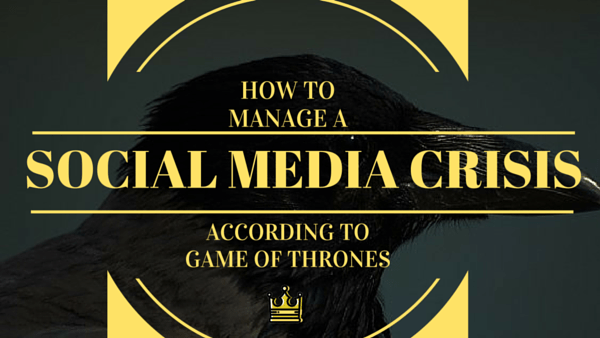 Download your Game Of Thrones Social Media Crisis Management Cheatsheet here. How do you manage a social media crisis? Like Cersei Lannister! Score a downloadable wall-chart to show off your social media knowledge and your GoT love! Subscribe to Rachel's newsletter now to access this download!